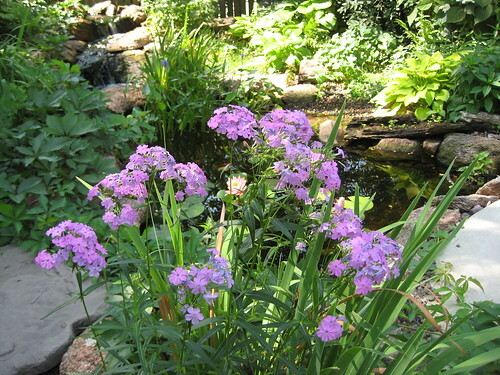 Phlox paniculata: I planted ‘Laura’ right next to the pond. It looks ok, but it’s just not as strong as the native marsh phlox. I’ll see what it looks like next year – it’s really unfair to compare a 2nd year perennial to a first year. Woodland sunflower (Helianthus strumosus): Nope, didn’t get this yet! A Rudbeckia of some sort – one that tolerates clay and shade: I planted a couple more Rudbeckia fulgida (orange coneflower) plants, and got a sweet black-eyed Susan (Rudbeckia subtomentosa) for the rain garden. So far so good; they’re both still on the small side compared with my older R. fulgida plants. 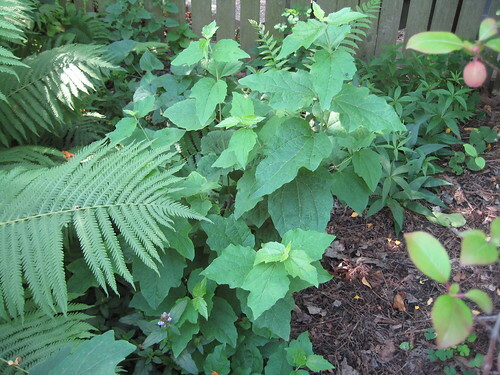 Echinacea pallida, to mix in with existing Echinacea purpurea: done, but they’re still small and haven’t bloomed yet. Virginia bluebells in the rain garden: done, but they disappeared in the summer heat. The proof will be in the spring. Allium cernuum: planted in the rain garden, and just about to bloom! An appropriate native sedge (Carex stipata? Carex vulpinoidea?) in the rain garden: I got Carex stipata, and they’re the best looking plants in the rain garden now. Dill seed: Grandma Einck’s dill from Seed Savers is looking gorgeous now, and it’s really tasty. Marigold seed – instead of buying flats of F1 hybrids, buy some self-seeding heirlooms – maybe Calendula instead? : I got calendula from Seed Savers as well, and the first bloom appeared this week. Snapdragon seed – any color but yellow, which I have plenty of already – red/purple would be nice: More Seed Savers; I’m just starting to see a wider variety of snapdragon blooms in the garden. white clover in the front yard: The spring plantings of this did well in shady spots, but not in the sunnier ones. I think I’ll look for some sun-tolerant grass seed for those areas, even though nothing in our yard gets more than a half-day of sun. The rain I’ve been hoping for – a nice steady rain to make up for the dryness of the past month – fell yesterday. Unfortunately, that was also our pond tour day. So, instead of spending the day in the backyard, we set up camp on our big covered front porch, escorting the occasional umbrella-laden group to the pond. 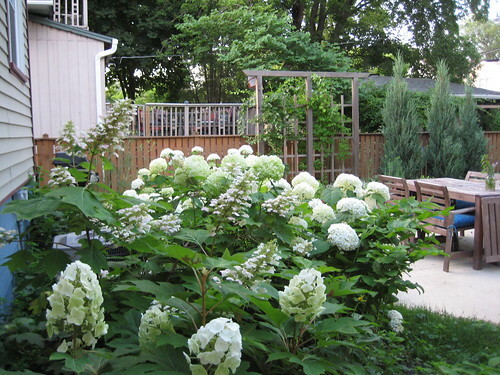 Everything looked pretty good except for the Annabelle hydrangeas, which were pretty droopy from the rain (and from my inadequate pruning job in late winter – something that I will endeavor to learn from). We received a bunch of compliments, and perhaps even some excess goldfish from other ponders. It ended up being a good but exhausting day. 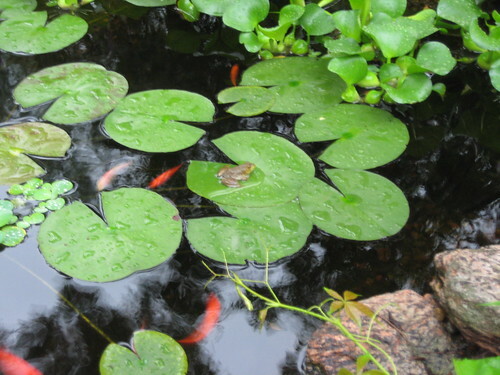 Besides the garden getting a good drink, the rain brought another benefit: one of our tadpoles is now a frog! 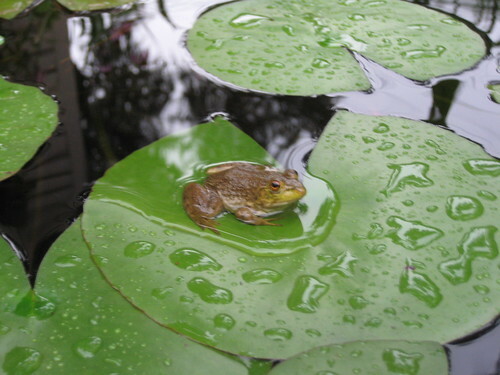 The tadpoles were purported to be from leopard frogs, but it seems like this one might be a green frog instead. We’ve been seeing something jump from our “beach” into the water when we walk by, but we never actually saw it stationary before yesterday morning. 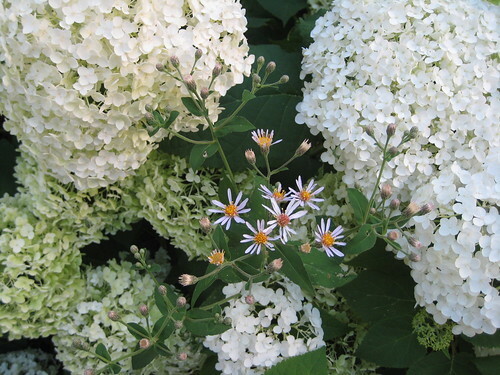 The first sign of fall: a big leaf aster (Aster macrophyllus) blooming among the Annabelle hydrangeas. 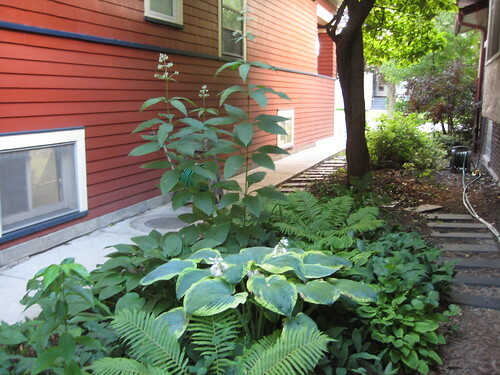 Just a quick posting this month – houseguests and work are seriously cutting into my gardening! 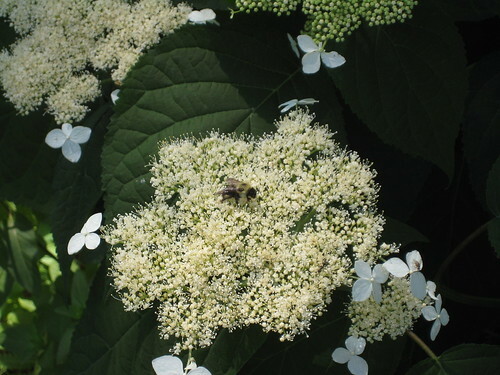 The hydrangeas — oakleaf & Annabelle — are in full bloom now, and the bees just love the Annabelle blossoms that have reverted to the wild type. The oakleafs are the bees’ second choice, and the regular Annabelle blooms are practically ignored. Does anyone know what kind of bee this is? Gloria? There are lots of berries in the garden now. 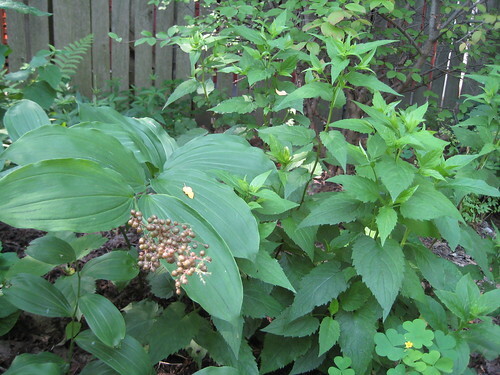 Solomon’s plume (Smilacina racemosa – above), red baneberry (Actaea rubra), and Caroline raspberry are all ripening. Unfortunately, there aren’t many berries on the blackhaw viburnum (Viburnum prunifolium) or Solomon’s seal (Polygonatum biflorum), although the latter may be due to someone making a meal of them before they ripen. I was so worried about the mapleleaf viburnum (Viburnum acerifolium) after it got nibbled down to nothing over the winter. It’s sprung back quite admirably. 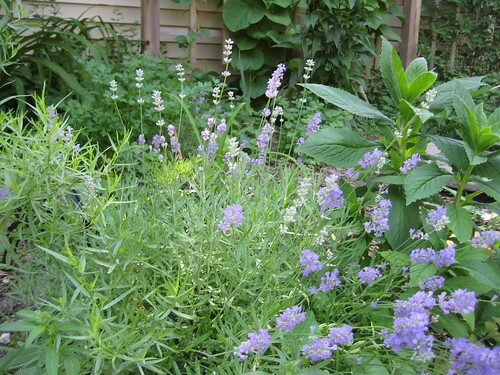 The Blue Cushion lavender is in bloom now and it smells wonderful. I planted two other Blue Cushion plants this spring, and they’re blooming too, albeit not as prolifically. 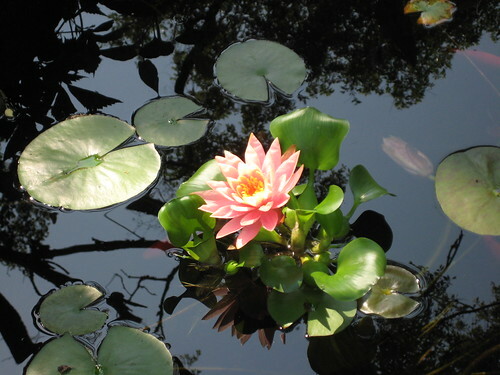 The Midwest Pond and Koi Society pond tour books are out, and just in time: it starts on July 12. There are several locations where you can buy a tour book all around the greater Chicago area. Each region’s ponds are only open for a day, so you should check now to see if there’s any ponds in your area that you might like to visit. We’re on it again this year, so please visit if you’re in town on July 19! 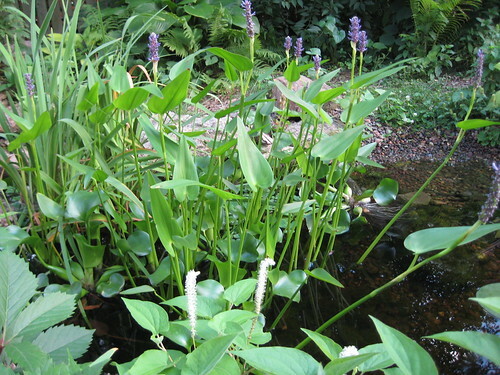 There’s also an Aquascape pond tour July 19-20, but only around Downers Grove and St. Charles. Downers Grove is between both the MPKS Central region (July 19) and the Southwest/West region (July 20), and St. Charles is in the West region, so it’ll be easy to hit both tours if you are interested.